5. WHAT’S UP WITH THE DVD? We (the eleven original members of The State) have worked closely with MTV to provide you with the best possible representation of our series. We want this to be the high quality DVD that so many of you have been asking for over the last ten years. To that end we have provided commentary from a different selection of us on each episode, and a treasure trove of extras, including more than an hour’s worth of unaired sketches (many of which should never have seen the light of day) never-released interviews from the time, promos, outtakes, our original (unaired) pilot and more. 1) Back in the free-wheeling 1990s, we had access to a huge library of popular songs to use as a soundtrack for the show. Today, licensing this music for the DVD would have cost us millions of dollars, and most of it was unavailable to us at any price. However, we have worked very closely with original series composer (and consummate rock star) Craig Wedren to carefully replace certain tracks, while maintaining the spirit of the original sketches as much as possible. The only moment in the whole series that we could not include on the DVD is a 15-second “link” where characters are singing a Pearl Jam song which we could not get the rights to. 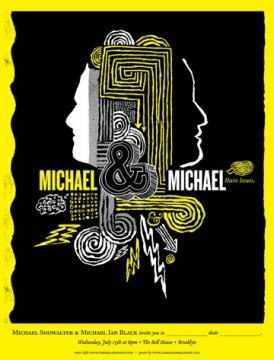 Also, and perhaps not uncoincidentally, Michael and Michael Have Issues, the new comedy series from two of the original members of The State, Michael Ian Black and Michael Showalter, is premiering on Comedy Central on Wednesday, July 15, 2009. On their new metaconceptual show, which makes its debut on Wednesday, Mr. Black and Mr. Showalter play the bickering stars of a sketch comedy program who never miss an opportunity to undermine each other. If you like to watch TV in large groups then you can head on over to The Bell House on Wednesday night and check the premiere of Michael & Michael Have Issues before a “live studio audience” including Messrs. Showalter and Black themselves. Listen to an audio conversation of Showalter and Black talking about The State‘s imminent DVD release, watch a video trailer for The State on DVD, or read full press release for The State on DVD after the jump. Yes, it’s really happening. At long last, MTV’s The State: The Complete Series will be available on DVD July 14th, for the first time ever! The cult-classic sketch comedy show featuring 11 comedic geniuses –many of which have gone on to direct, write and star in a host of successful film and television projects — arrives to quench the demands of countless die-hard fans and petitioners. Authorized and produced in cooperation with the cast, the 5-disc DVD set features the brains behind “RENO 911!”, “STELLA,” “Viva Variety,” Role Models and Wet Hot American Summer and includes every hilarious episode and hours of fantastic bonus features including over 90 minutes of unaired sketches, full-length audio commentary, cast interviews, outtakes and more. Be sure to check out TheState.mtv.com for the latest updates! “The State” launched the careers of the multi-talented cast, many of whom are now considered some of the most formidable comedic performers and writers of their generation. Catch every hysterical moment with Michael Ian Black (“Ed,” “STELLA,” “Viva Variety,” Run, Fat Boy, Run), Michael Showalter (“STELLA,” The Baxter, Wet Hot American Summer), David Wain (“STELLA,” Role Models, The Ten, “Wainy Days”), Robert Ben Garant (“RENO 911!,” Viva Variety, Balls of Fury), Kerri Kenney-Silver (“RENO 911!”, “Viva Variety”), Thomas Lennon (“RENO 911!”, I Love You Man, Balls of Fury), Joe Lo Truglio (“RENO911!”, Superbad, I Love You Man), Ken Marino (“Party Down,” The Ten, Diggers), Michael Patrick Jann (RENO 911! : Miami, Let’s Go to Prison) Kevin Allison (The Ten, RENO 911! : Miami), and Todd Holoubek (“You Wrote It, You Watch It”). “The State” was simply one of the sharpest, funniest and most underrated shows to debut in the 1990’s. Originally created as MTV’s first foray into the sketch comedy genre, “The State” was a comedic gem that rocked Generation X with slapstick, smarts and witty sarcasm. The dynamic cast features 11 exceptional actors that have continued to collaborate on hit projects. EW.com raved “[The State is] the hippest, most accessible, and most consistently funny of the sketch troupes.” MTV’s timeless sketch comedy show, “The State” is finally here! 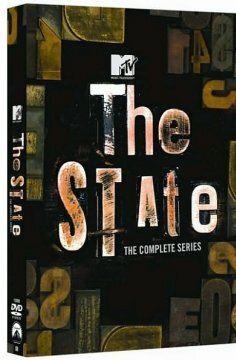 The State: The Complete Series is a five-disc set jam-packed with the special features outlined below. Season One of “The State” exhibits the humble beginnings of one of the coolest sketch comedy shows ever, and the birth to some of its most popular characters. The cast responds to its critics with razor-sharp wit and an arsenal of trademark high-energy performances. The network’s reins loosen and the eleven members of “The State” are allowed to get as weird as they want, ultimately rounding out their comedic formula. The cast says goodbye, but not before leaving viewers with a fiery blaze of comic glory. Disc 5 features a jaw-dropping collection of material that the guys didn’t consider to be ready for TV, plus the Pilot, Special Appearances, Outtakes and more.